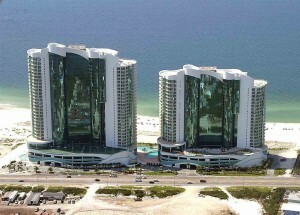 Orange Beach gulf-front condo for sale at Turquoise Place – the most prestigious residential community residence on the Alabama, with 500’ of white-sand beach and resort-style amenities second to none.. From this beachfront property, you get the full east and west gulf views – the best in the building. Indoor air-conditioned hallway leads you to unit that contains 3 bedrooms and 3.5 baths. The kitchen has top of the line wolf & sub-zero stainless appliances,a gas stove-top, wet bar with wine cooler and granite counter-tops. Living room has tile flooring & has a gas fireplace. Master bath has a jetted tub & walk in shower. Floor to ceiling sliding glass doors lead you from living room or master to spectacular views on the gulf front balcony, which features a hot tub and gas grill. Amenities at Turquoise Place are unsurpassed and include two outdoor pools, two heated indoor pools, a lazy-river, three hot tubs, covered parking spaces, poolside snack bar & much more. This condominium is simply incredible – you have to come see it for yourself.